An advanced alien species attempts to prevent the Earth from destroying the universe with atomic weaponry by taking over the minds of three recently deceased corposes (Bela Lugosi, Vampira, and Tor Johnson). In the opening of his review for this infamously awful film — voted the “World’s Worst Film” by readers of the Medved brothers’ Golden Turkey Awards — Peary writes that in an “era when bad-film freaks have come out of the closet and really awful films are looked on with affection, Edward D. Wood’s berserk sci-fi film is revered by a large and growing cult who contend that it has moved beyond camp to legend status” (indeed, he analyzes it at length in his first Cult Movies book). Peary facetiously notes that if you “give a monkey a camera… it’ll make a better picture”, and will “certainly do a better job with the money” (neither of which is quite true), and notes that “every facet of this production, from acting, script, and direction to special effects, prop selection, and editing, is putrid” — “so putrid that the film is hilarious”. The production history of this notoriously awful howler is so well-documented that I humbly refer you to any of the reviews referenced below (or to Wikipedia’s article). In a nutshell, Wood appears to have cobbled his film together out of the very limited resources he had at hand — starting with two minutes of footage of his recently deceased friend, Bela Lugosi, whose character is thereafter played by his wife’s chiropractor, hiding his face behind a cape. The result is a film in which nearly every “bad movie” element one can think of shows up — and (as noted in Peary’s Cult Movies review), “except for about a hundred dull spots”, it’s actually “a lot of fun”. 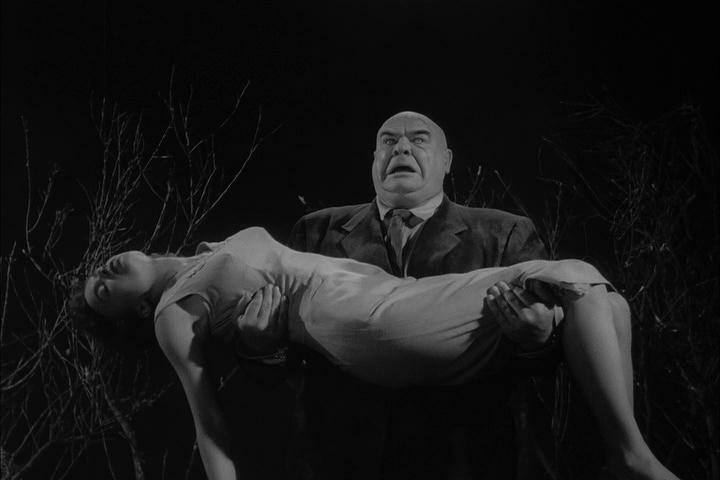 In his more extended review, Peary calls out the film’s many hilariously awful features, including the “terrible cheap sets”; the hideous interpolation of shots taking place in daytime and nighttime; the flying saucers (made out of paper plates) which “look like chinaware flung into the air”; the way that “everyone fails to respond while The Ghoul Man… strangles Officer Calvin in front of their eyes”; and, of course, the “incomparable dialogue” — all of which make for a surprisingly entertaining viewing experience, if you’re in the right mood. Interestingly, Peary argues that Wood made a film which is so “atrocious” that perhaps he hoped “censors wouldn’t bother with [the] subversive themes”. 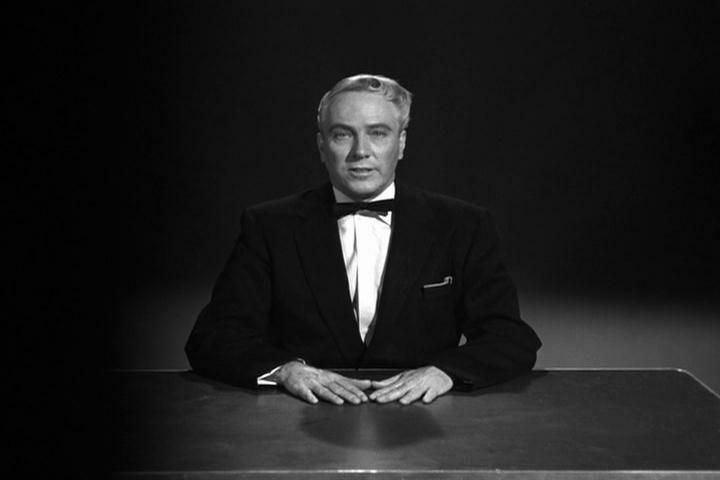 He suggests that in “this one God-awful, terribly made, poor excuse for a picture, Wood is more critical of America’s government (which conceals much from the public) and military strategy (that calls for an arms build-up and further nuclear testing) than any other director of the period dared to be.” That alone, as Peary writes, may be reason enough to relegate “another, less daring film to wear” this film’s dubious “World’s Worst film banner”; he quickly notes, however, that he’s “just kidding”. P.S. In his review, Peary mentions that “God [only] knows what the first eight ‘Plans’ were” — but if you’d like to hear one band’s take on this hypothetical question, click here. P.P.S. 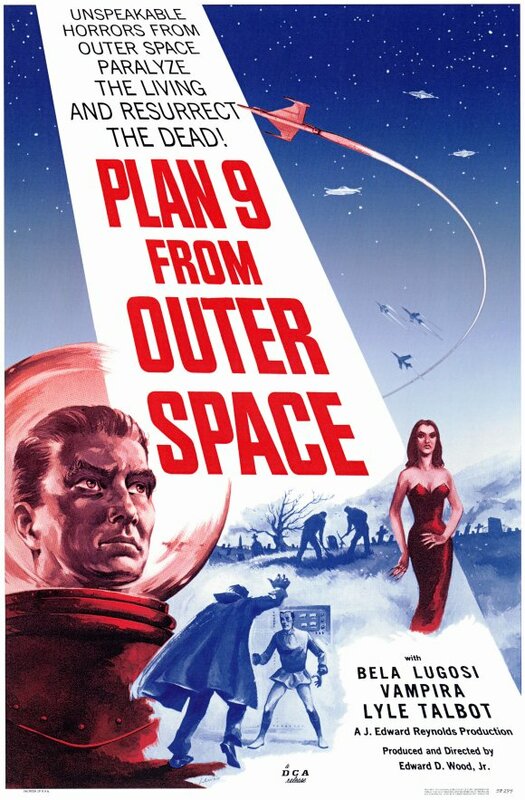 Since Plan 9 is in the public domain, it’s available for free viewing at http://www.archive.org/. Of course — as the ultimate “bad movie” experience. Check out the second paragraph of Richard Scheib’s review for an illuminating overview of the various types of “bad” movies out there; he convincingly argues that the term “bad” is far too vague to fit the spectrum of ineptitude present in the world of cinema. A once-must, as a cult/camp classic. Is ‘Plan 9’ the worst movie ever made? Well…no. Of course not. There is a whole bunch of other stuff on film (not necessarily directed by Ed Wood, Jr.) that is very nearly unwatchable. And there are Herschell Gordon Lewis movies out there too, y’know. You can do a whole lot worse than well-meaning Ed. If I remember correctly…in Tim Burton’s affectionate and charming biopic, ‘Ed Wood’, Johnny Depp (as Ed) is watching ‘Plan 9’ when he says something out loud like, “This is it…the one I’ll be remembered for.” Though it’s a funny line, it’s doubtful Ed would’ve said that. The statement may have turned out to be true, but I prefer remembering Ed for titles like ‘Glen or Glenda’ and ‘Bride of the Monster’ – both of which are actually ‘better’ movies. ‘Plan 9’ is not the mess many say it is. On its own wacky terms, the plot actually makes its own sense. It’s certainly one that ffs won’t want to miss – and fun and earnestness are found inside it – but it’s not Ed at his entertaining best.